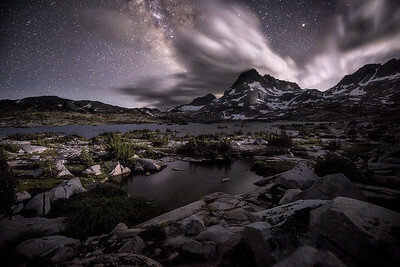 Clouds spill over mountain peaks as the moon sets in the Sierra Nevada Mountain Range. 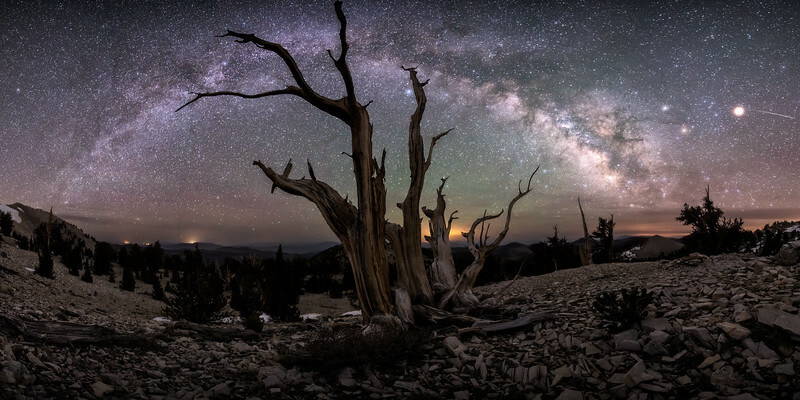 This area is home to the oldest trees in the world, Bristlecone Pines. 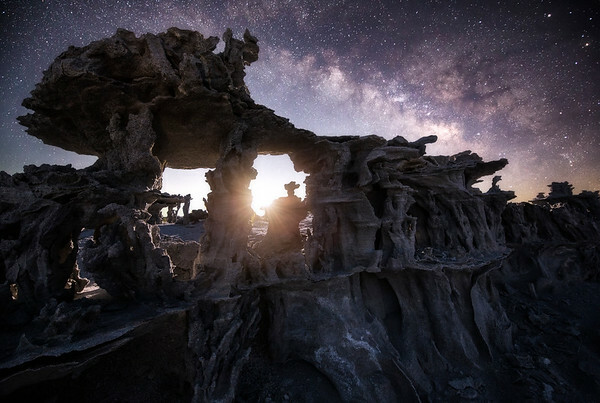 Some of these living trees exceed 4000 years of age. Imagine a living tree as old as the pyramids. 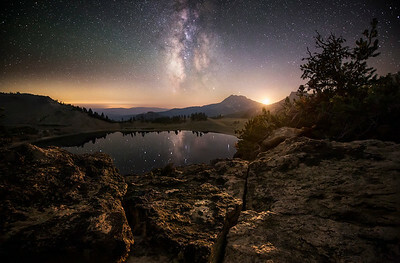 The moon sets and the Milky Way reflects off an alpine lake in Northern California. Points of light flashed over me in an interminable stream, as the faint rounds of silent fireworks dropped into the void. 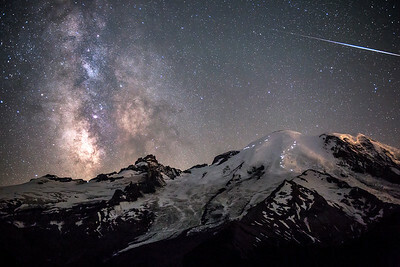 Hikers climb towards the top of Mount Rainier as the night sky dances above taken during the Alpha Capricornids meteor shower. The power of the world is done in a circle. The wind whirls, stars rotate; the sun and moon- both round, comes forth and goes down again. 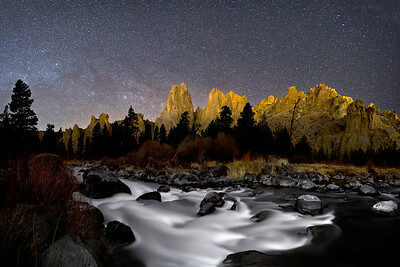 Likewise, ancient recurring cycles of events penetrated the Crooked River and created the flanks of these majestic, multi-colored formations. 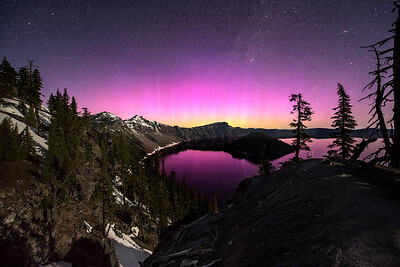 An extremely, rare appearance of the aurora borealis over Crater Lake National Park in Central Oregon. 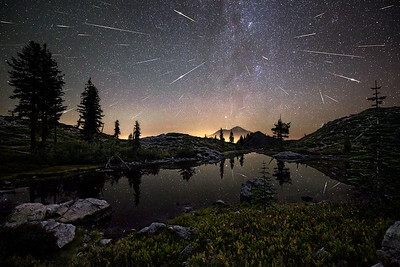 You can also see the Milky Way, the Andromeda Galaxy, and the north star, Polaris. Crater Lake National Park, located high within the Cascade Mountains, provides visitors with knowledge and beauty the way her volcanic eruption produced lava 7700 years ago—steadily flowing with periodic bursts of insight and wonder. Her indigenous allure aroused deeper exploration, so I detoured off the grid and slowly trudged into the forested abyss. 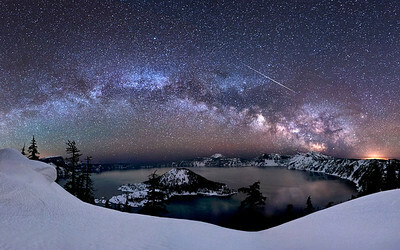 Just beyond the icy caldera rim, America’s deepest lake mirrored the prodigy of the night and created a liquid snapshot of man versus nature. 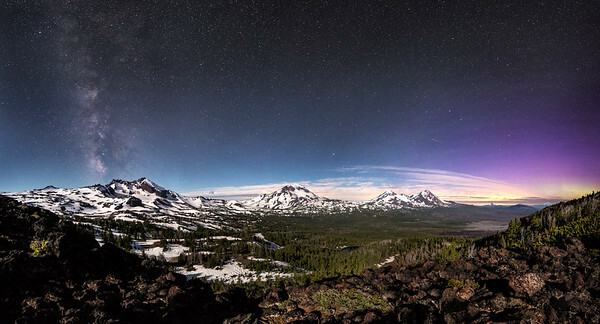 In this panoramic image, you can spot each of the seven peaks making up a portion of the Cascade Range. 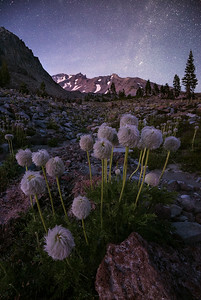 From left to right: Broken Top, South Sister (Charity), Middle Sister (Hope), North Sister (Faith), Mount Washington, Three Fingered Jack, and Mount Jefferson. 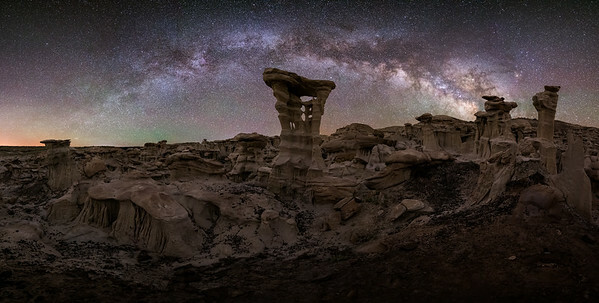 You can also see the Milky Way and a hint of the aurora borealis. 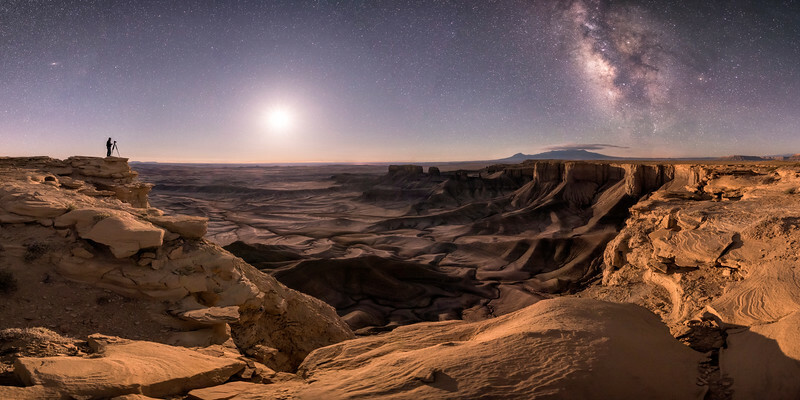 Overall Winner & People and Space Winner of the 2018 Astronomy Photographer of the Year Interested in adding a 'human element' to the image, once the quarter moon rose and revealed the vast landscape of the shale hills below the viewpoint, the lone photographer stood motionless while I captured this photograph. 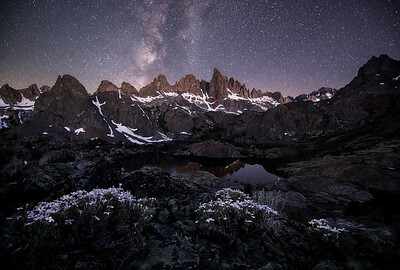 The Andromeda Galaxy, quarter moon, Milky Way Galaxy, and position of the photographer all combined to create a harmonious portrait of a night sky photographer at work. Moab, Utah, USA, May 20, 2017. 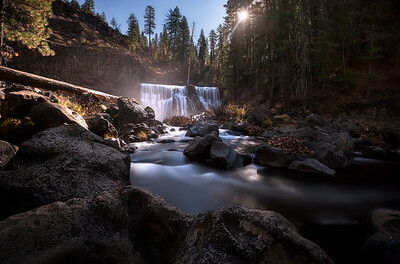 This original version has been designed for 1:2 aspect ratio prints (12x24 inches). 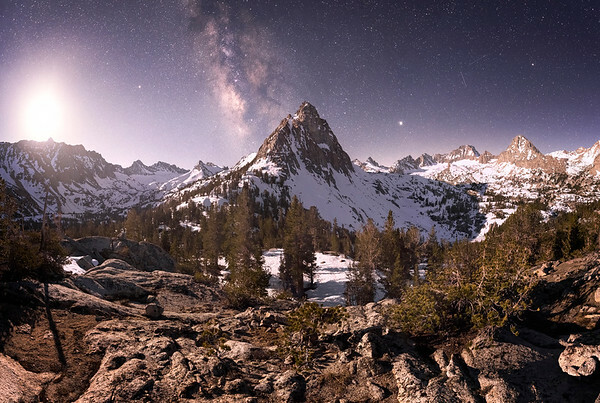 This panoramic image was taken in the Sierra Nevada Mountains and includes Mars, Saturn, and Jupiter.